Home / News / LORETA Book Officially Released! We want to congratulate author Dr. Rex Cannon for his patient and devoted work with this text. We hope that those interested in LORETA will find the nearly 2 years that it took to complete this book worth the wait. 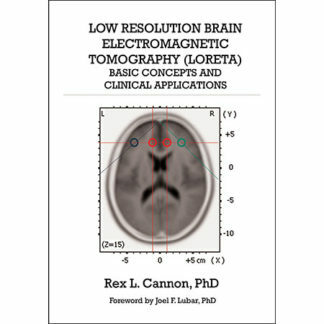 There is little doubt that Dr. Cannon created a novel and much needed LORETA resource for the fields of electroencephalography (EEG / QEEG), neuroscience, and neurofeedback – in fact, this is the only known LORETA book available today. Those new to LORETA software will find this to be an especially valuable book as Dr. Cannon provides a step-by-step navigation tutorial of the LORETA interface. Experienced LORETA practitioners will also enjoy the advanced topics and discussions that follow the introductory chapters. Readers will also appreciate the large size print (7″ x 10″) and full color images that facilitate easy readability and interpretation of the numerous LORETA brain map images and figures. Low Resolution Brain Electromagnetic Tomography (LORETA): Basic Concepts and Clinical Applications can be purchased here with free shipping (free shipping is for United States only). Readers who purchase this book should also download the LORETA software. LORETA software is available free of charge from The KEY Institute for Brain-Mind Research, University Hospital of Psychiatry, Zurich, Switzerland. Download the software here. Next post: BMED Press Books In Australia!